Concerts are usually a great time, but things can turn bad in a heartbeat. Of course no one expects to go to a concert and actually die but it can, and does happen. Here are some of the worst concert tragedies over the years that have rocked and shocked us. Organized and headlined by the Rolling Stones, the Altamont Festival also featured Santana, Jefferson Airplane, The Flying Burrito Brothers and Crosby, Stills, Nash and Young. The Grateful Dead were originally included in the lineup but they bailed out because the event was so disorganized. Some heralded the event as being “Woodstock West,” with roughly 300,000 people in attendance. What started out as a good idea is best remembered as an event marred by violence and death. The Rolling Stones hired motorcycle gang Hells Angels to provide security at the event. They traded the Angels $500 worth of beer in return for controlling the crowd. During the Stones’ set, an 18-year-old black man named Meredith Hunter got into an altercation with the Hells Angels. He drew a long-barreled revolver and a member of the Hells Angels stabbed him five times. He was then kicked to death. 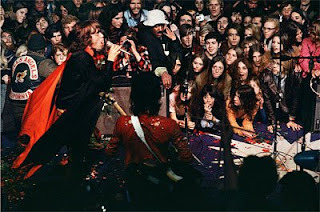 The entire brutal event was captured on film by three cameras because documentary filmmakers Albert and David Maysles were there filming the Stones’ 1969 US tour, which was later made into the film Gimme Shelter. Two people also died in a hit-and-run, another drowned and 850 were injured. It was December 3rd, 1979, and 18,500 fans had gathered outside the Coliseum in Cincinnati. The concert was general admission, meaning that the best seats in the house were first come, first serve and already more people had gathered than the venue could hold. The energetic scene quickly turned chaotic as the large crowd surged toward the doors, trampling upon and crushing 11 people to death. 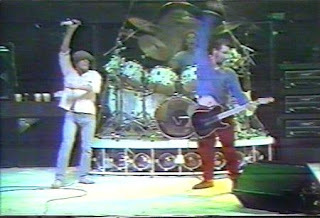 The Who were not informed of the deaths until after the show. Needless to say, the band was very upset to learn that fans had died trying to get into their show. The tragedy in Cincinnati was the result of a lack of crowd management at the event. In the wake of the deaths, a lot of attention was directed to the importance of crowd control, and Cincinnati put a moratorium on general admission seating. Inspired by the famous music festival Woodstock, the Roskilde Festival in Denmark is Europe’s largest outdoor concert. In the year 2000, it drew a crowd of about 100,000. 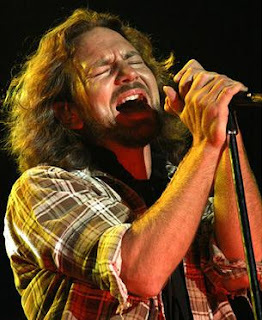 In June of 2000, Pearl Jam took to the stage in front of a crowd of about 50,000 people. Fans in the back of the crowd couldn’t hear the music well enough so they decided to move up. The crowd pushed towards the front of the stage, sparking a stampede that crushed people near the front. The band repeatedly asked the crowd to move back but they did not comply. Some people slipped and fell in front of the stage and were trampled to death. People were climbing on top of each other to get air. The tragic event caused the Cure, who was next to perform, to cancel their set although shows continued on at the other stages. In total, eight people lost their lives. On the night of February 20, 2003, the fourth-deadliest nightclub fire in U.S. history claimed 100 lives at the Station nightclub in West Warwick, Rhode Island. The band Great White was headlining the show that quickly turned into a nightmare. The band had just started playing the first song in their set when the tour manager Daniel Biechele set off a pyrotechnics display. Sparks from the display ignited the soundproofing foam and the whole place quickly went up in smoke as fans were trapped inside. The club’s capacity was 250 people and there were 432 people there. As fans stampeded towards the door, the exit quickly became blocked, trapping many inside where they perished in the flames. Although there were other exits, people naturally headed for the door where they came in, causing a deadly bottleneck situation. 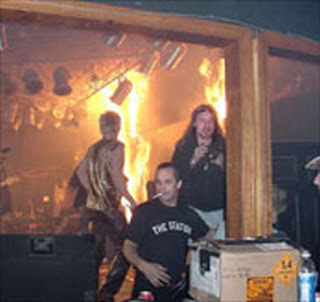 A reporter who was ironically doing a story on club safety captured the entire fire. You can see how quickly the flames spread and how hard it was for people to escape. dimebag1.jpgOn December 8th, 2004, Damageplan was playing at the Alrosa Villa nightclub in Columbus, Ohio when guitarist “Dimebag” Darrell Abbott (of Pantera fame) was shot and killed by a gunman. Damageplan had just begun playing the first song in their set for a crowd of about 250 people when gunman Nathan Gale jumped on stage and shot Dimebag several times in the chest after making comments about Pantera. Gale then opened fire on the crowd. Gale took a hostage onstage and was about to shoot him when Columbus police officer James Niggemeyer took him out with a single fatal shotgun blast. Gale had fired a total of 15 shots and five people died in total. It turns out that Gale was a paranoid schizophrenic former US Marine who was having delusions that Pantera was stealing his thoughts and were laughing at him. Dozens of people died when a trailer-truck loaded with highly flammable chemicals exploded in a road accident in northern Mexico, Mexican media reported on Monday. The blast left a crater of up to 65 feet (20 meters) in diameter in the road in the northern state of Coahuila, the El Universal daily said on its Web site. The paper, quoting police, said 37 people were killed when the blast erupted after the trailer-truck hit another truck. But the civil protection agency put the death toll at 25. "Part of the trailer caught fire after the crash and that's where the explosion came from," said state Gov. Humberto Moreira. Some 150 people were injured. Most of the people who died, including three newspaper journalists, had rushed to the scene of the crash. "Reporters who were taking photographs died there as well as emergency workers and drivers who stopped to help," Moreira said. The trailer-truck was carrying 25 tonnes of a derivative of the volatile ammonium nitrate chemical used for fertilizers, civil protection authorities said. The media had earlier said it had been carrying explosives. Police are investigating exactly how the car managed to "take off" from street level and crash into the house in Basingstoke, Hants, on Wednesday. The men's condition is described as serious, but stable. 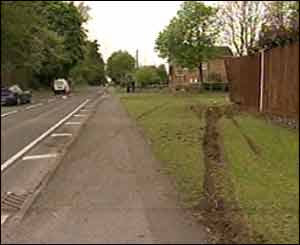 Police want to speak to a third man, who was helped from the car but then left the scene. 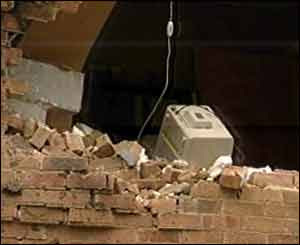 The occupants escaped uninjured as they were asleep in another bedroom. A police spokeswoman said that one man was found in a passenger seat and the other man, who they believe could be the driver, was found under the front wheels. 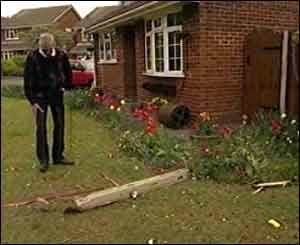 Joyce Harman told BBC News how she and her husband Joe were woken by the crash. "It was just horrendous," she said. "My husband thought the dog had knocked something over downstairs but as he got to the bedroom door he could see the hole in the wall and all the furniture moved. "That's when we came downstairs and saw the car there." The Harmans have been told they will not be able to live in their home for at least two months and that it will have to be partially rebuilt. The damaged room was their study, which used to be their children's bedroom. 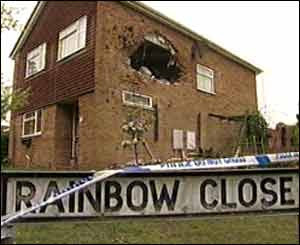 The couple's neighbour, George Harrison, said what had happened was "just absolutely incredible." 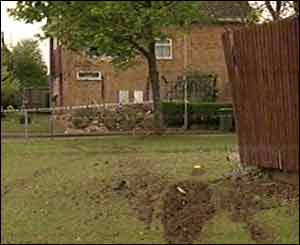 "The fence has been knocked down and the car's gone through a pathway, a signpost, a tree and the front lawn. "How this happened I shall never know." A Hampshire Police spokesperson said the red BMW lost control on a bend of the nearby A30, hit the kerb and "launched through the air, colliding with the first floor of a house in Rainbow Close." "A full investigation has been launched into the circumstances of the crash and how the vehicle collided with the first floor," she said. Officers have not yet dismissed reports that a third person may have been driving the car. 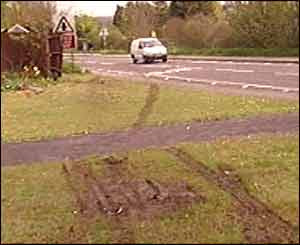 They are trying to trace the vehicle's registered owner, but it was not reported stolen at the time of the crash. The injured people have not been named.